Interplay is a meeting of minds and spirits, one that embraces virtuosity, spontaneity, and lyricism through a repertoire of standards and original music adapted to the unique instrumentation of acoustic bass and voice. It features 11 tracks recorded at Sear Sound Studios in New York and Studio le Meudon in Paris. 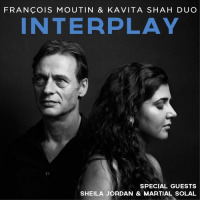 Kavita Shah and Francois Moutin are also joined by their octogenarian mentors–NEA Jazz Master Sheila Jordan on vocals, considered by many as the pioneer of bass-and-voice duets, and legendary pianist Martial Solal–on two tracks each. The result is an improvisational journey across lyric-driven and wordless pieces alike. The Duo also released their upcoming tour dates in support of the album. Filling 14 shows over 21 days stating in late March, this International tour will also feature a performances at the famous Sunset-Sunside Jazz Club in Paris, France as well as at Jazzahead in Bremen, Germany. The entire tour listing is found below. François Moutin, a virtuosic bassist, was born in Paris and received a doctorate in physics at the age of 24 before choosing to become a professional musician. He has been a member of the Martial Solal Trio for three decades and, since age 29, he has co-lead a string of projects with his twin brother Louis, most noticeably the Moutin Reunion Quartet and presently the Moutin Factory Quintet. He regularly composes and tours extensively with this group around the world. In addition, François has worked with such musicians as: Jean Michel Pilc, Randy Brecker, Dave Liebman, Toots Thielemans, Michel Legrand, Lew Soloff, Rudresh Mahanthappa and Jack de Johnette just to name a few. Kavita Shah is an award-winning vocalist, composer, and lifelong New Yorker who makes work in deep engagement with the jazz idiom while addressing and advancing its global sensibilities. Hailed by NPR for possessing an “amazing dexterity for musical languages,” Kavita incorporates strands of Latin American, West African, and South Asian traditions into her original music. Not unlike François, Kavita studied Romance Languages & Literatures at Harvard before pursuing a Master’s in jazz voice at Manhattan School of Music. In 2012, she was named Downbeat’s Best Graduate Jazz Vocalist; in 2013, she won ASCAP’s Herb Alpert Young Jazz Composers Award. Her debut album, VISIONS, co-produced by Lionel Loueke, was released in 2014 to great critical acclaim. Kavita regularly brings her music to world-class stages such as the Kennedy Center, Duc des Lombards, Blue Note and numerous jazz festivals across the Americas, Europe, and Australia.